Intra-abdominal injuries resulting from blunt torso trauma are a leading cause of morbidity in children and account for a significant number of ED admissions each year. Identifying these injuries early is critical to reducing morbidity and mortality from delayed or missed diagnoses. In recent years, CT has become standard for diagnosing many traumatic injuries, including those within the abdomen. At the same time, however, CT use in trauma and emergency care has expanded much faster than evidence for its use. Recently, several smaller investigations have suggested that children with blunt torso trauma can be stratified by risk for intra-abdominal injury using a combination of readily accessible clinical factors. These studies, however, have been limited by their retrospective or single-center study designs and small samples. 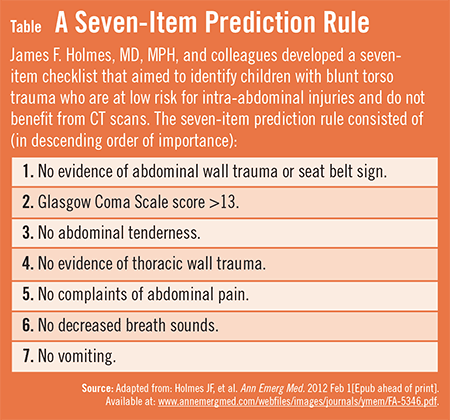 In an effort to overcome these limitations, Dr. Holmes and colleagues had a study published in Annals of Emergency Medicine that aimed to derive a prediction rule that identifies children with blunt torso trauma for whom CT would generally not be indicated. More than 12,000 children (average age, 11.1 years) from 20 EDs with blunt torso trauma were enrolled in the prospective analysis by Dr. Holmes’s study team. A prediction rule was created using a seven-item checklist that included patient history and physical examination variables readily available without the need for using laboratory or ultrasound data (Table). The prediction rule requires external validation before it can be implemented more widely, says Dr. Holmes. “The checklist relies on the clinical exam and judgment of attending emergency physicians. It doesn’t, however, mandate which children should undergo abdominal CT. Prediction rules are intended to aid and empower clinicians by providing evidence with regard to risk but must be used in conjunction with sound clinical judgment to provide optimal care. For children who aren’t at low risk (eg, are positive for one of the variables), the rule is meant to assist clinicians by providing evidence to aid clinical decision making.” Many who are positive for the rule can still be managed without CT scanning. Importantly, Dr. Holmes’s study team recommends that clinicians carefully consider which children may benefit from screening laboratory tests or focused assessment sonography for trauma. All patients being discharged from the ED should be provided with proper instructions about indications to return for medical care. Patients admitted for other injuries should also be carefully assessed for intra-abdominal injury to avoid complications that can occur after a missed or delayed diagnosis. Holmes JF, Lillis K, Monroe D; for the Pediatric Emergency Care Applied Research Network (PECARN). 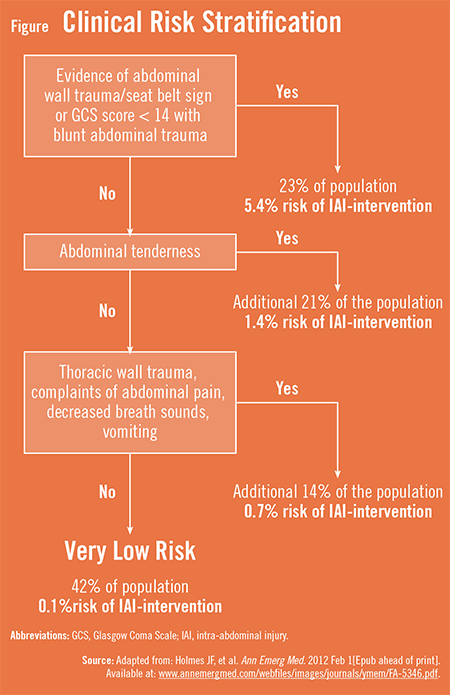 Identifying children at very low risk of clinically important blunt abdominal injuries. Ann Emerg Med. 2012 Feb 1[Epub ahead of print]. Available at: http://www.annemergmed.com/webfiles/images/journals/ymem/FA-5346.pdf. Holmes JF, Gladman A, Chang CH. Performance of abdominal ultrasonography in pediatric blunt trauma patients: a meta-analysis. J Pediatr Surg. 2007;42:1588-1594. Nigrovic LE, Schunk JE, Foerster A, et al. The effect of observation on cranial computed tomography utilization for children after blunt head trauma. Pediatrics. 2011;127:1067-1073. Larson DB, Johnson LW, Schnell BM, et al. Rising use of CT in child visits to the emergency department in the United States, 1995-2008. Radiology. 2011;259:793-801. Broder J, Fordham LA, Warshauer DM. Increasing utilization of computed tomography in the pediatric emergency department, 2000-2006. Emerg Radiol. 2007;14:227-232. Holmes JF, Sokolove PE, Land C, et al. Identification of intra-abdominal injuries in children hospitalized following blunt torso trauma. Acad Emerg Med. 1999;6:799-806. Kuppermann N, Holmes JF, Dayan PS, et al. Identification of children at very low risk of clinically-important brain injuries after head trauma: a prospective cohort study. Lancet. 2009;374:1160-1170. James F. Holmes, MD, MPH, has indicated to Physician’s Weekly that he has worked in the past as a paid speaker for Northwest Seminars, and has received grants/research aid from the CDC, NIH, Emergency Medical Services Corporation, Emergency Medicine Foundation, and the Society for Academic Emergency Medicine.